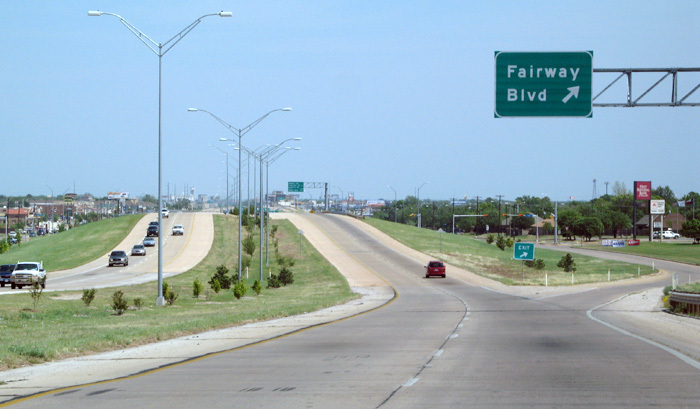 Wichita Falls has a nice freeway system for a small town. 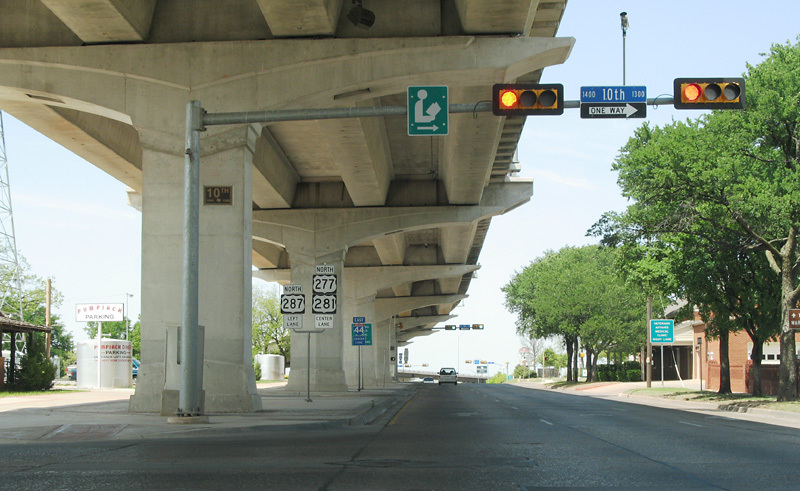 The most interesting feature of Wichita Falls' freeways is the downtown elevated structure, which opened on November 13, 2001. 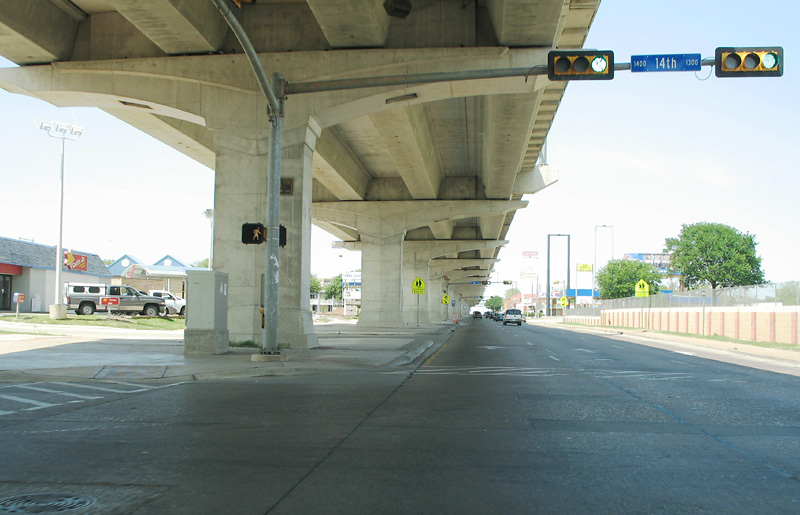 The offical TxDOT web page provides more information and photos about the elevated freeway project. 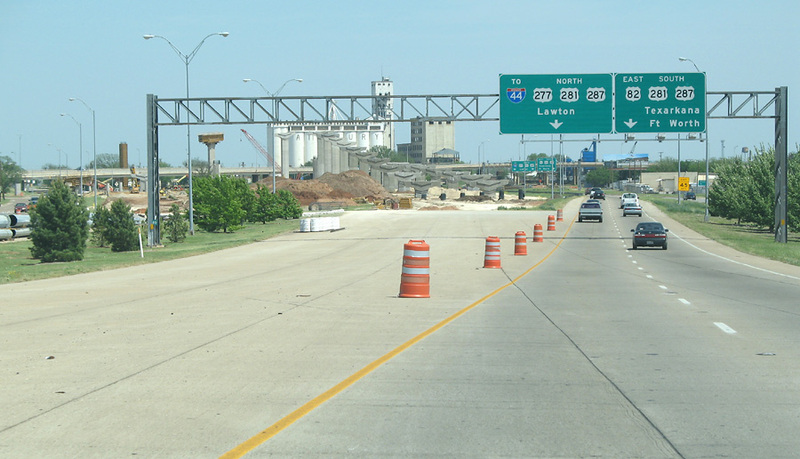 As of April 2006 the main action in Wichita Falls is the contruction of four direct connector ramps to exchange traffic between the Kell Freeway (US 82/277) and US 287/281. The contract was awarded in August 2005 and work is proceeding quickly. 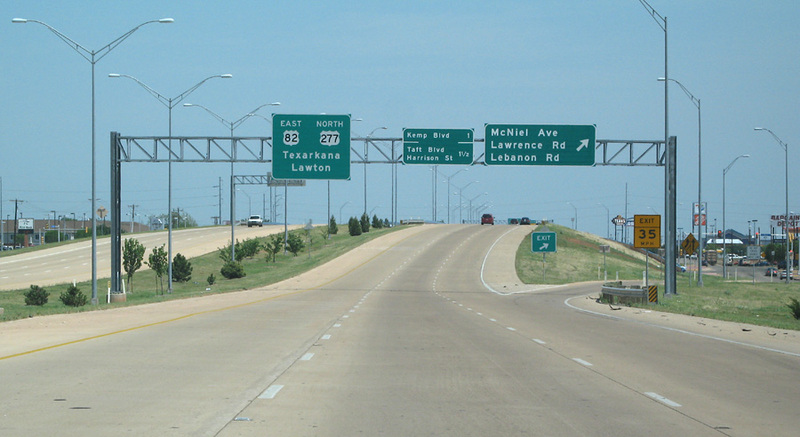 On US 287, the northbound frontage road is closed as you approach the interchange from the south. 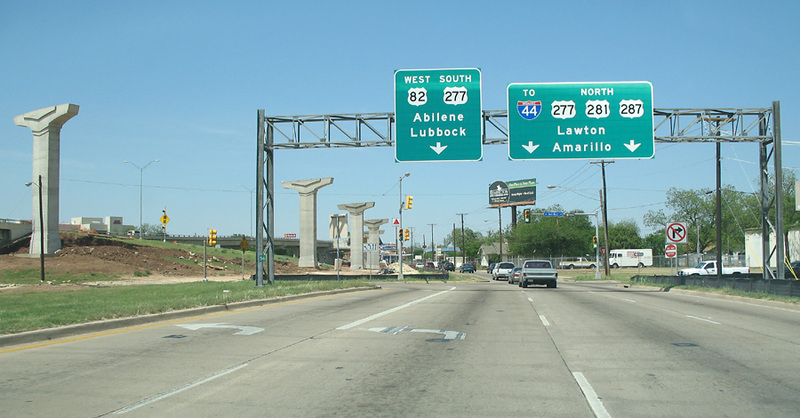 Here we are approaching the interchange construction zone on US 287 northbound. You can see some of the piers for the ramps. I exited back to the frontage road. Here is the intersection with the 82/277 frontage roads. 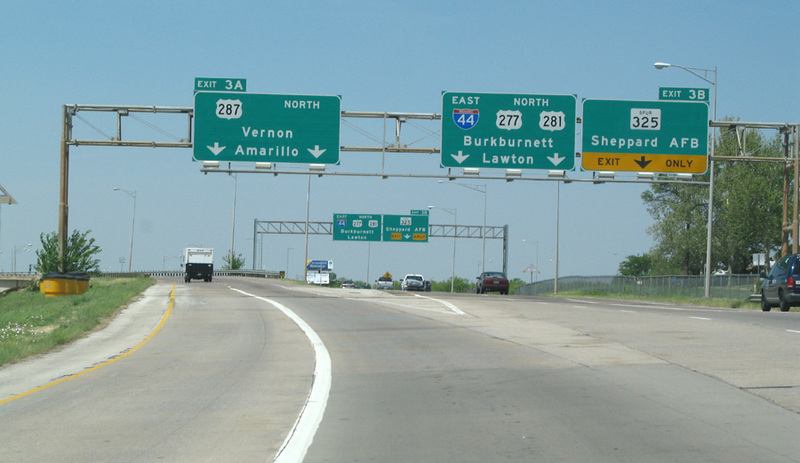 Currently connections are made via the frontage roads. 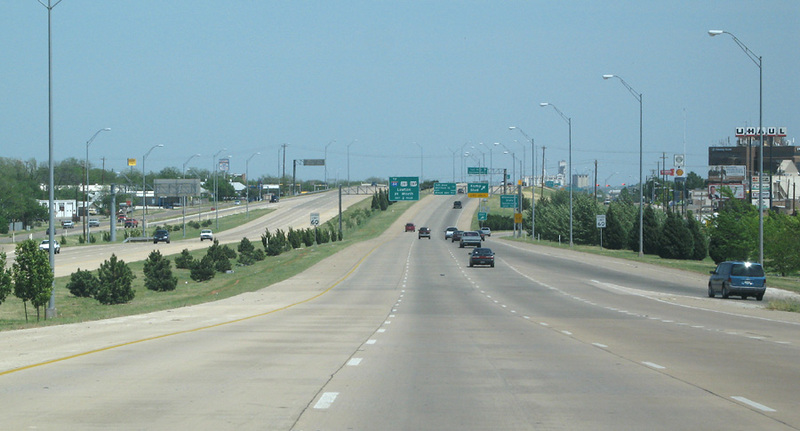 This view looks northeast with the eastbound 82/277 frontage road in the foreground. This view looks east at some of the piers. Another east-looking view of the piers. 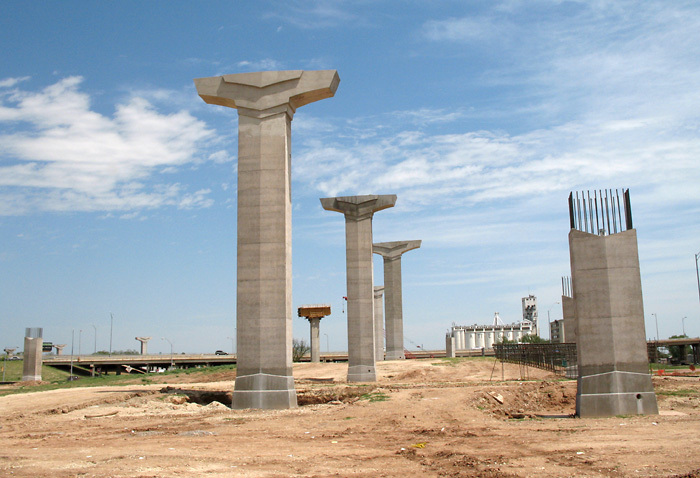 This view looks northeast along the piers that will form the ramp for the connection from southbound 287 to westbound 82/277. 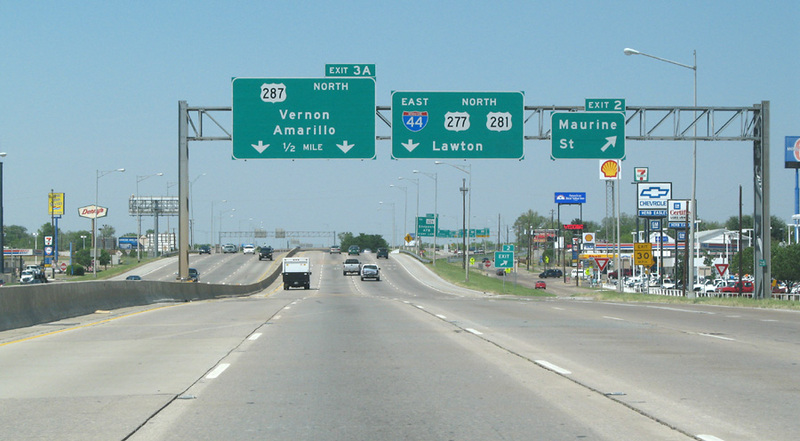 The US 82/277 is a nice, relatively new freeway in southwest Wichita Falls. 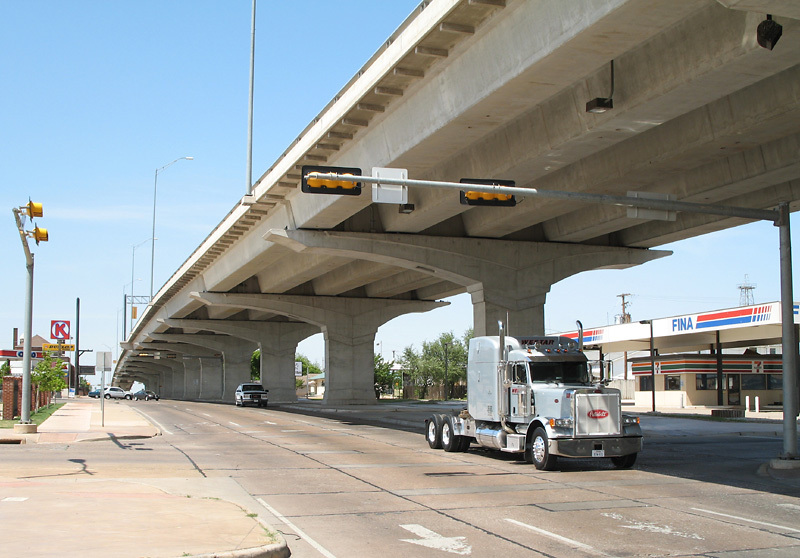 The official TxDOT web site reports on the history of this freeway. Here are a few excerpts. Plan work started in the late 60's. 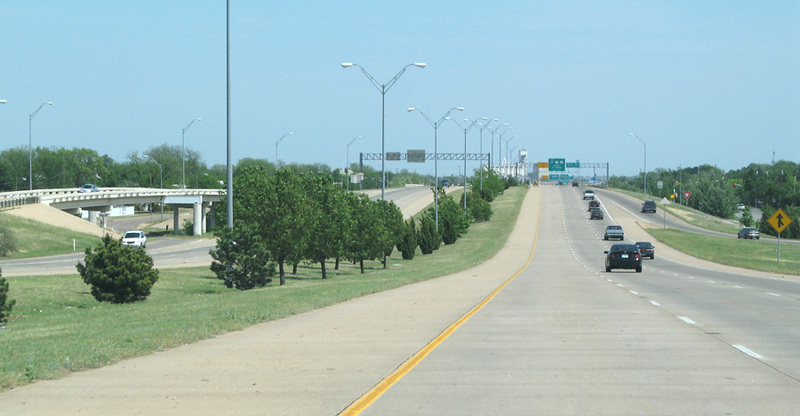 In 1967 the City of Wichita Falls held a bond election to pay for half of the $6 million needed to buy right of way. 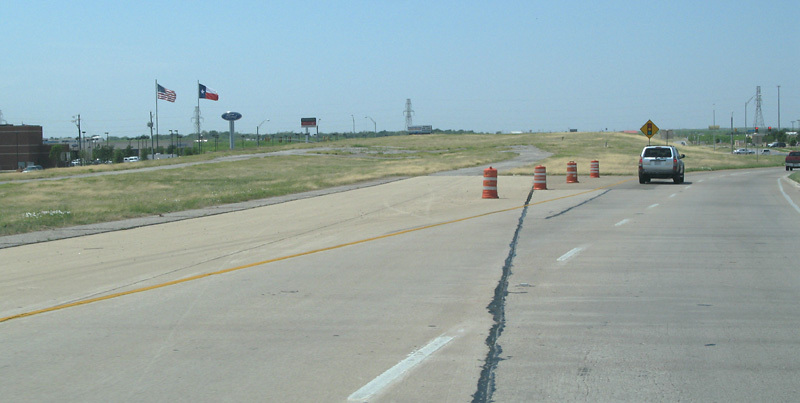 TxDOT funded the other half of the property acquisition. 448 homes and businesses were bought and the landowners relocated to make way for the Kell Freeway. 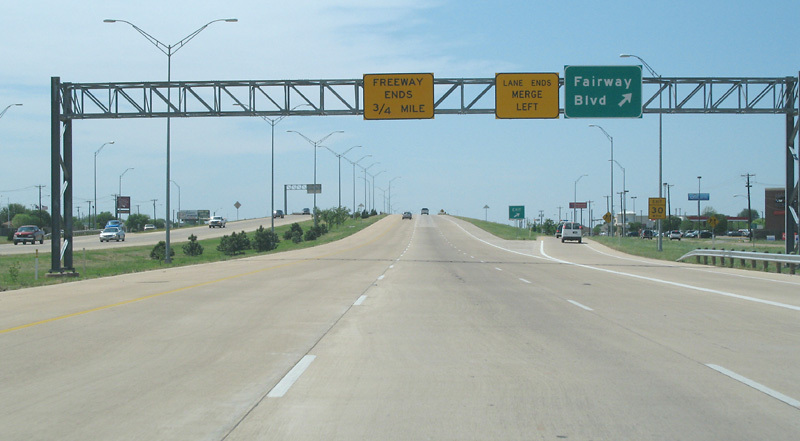 During the 70's the frontage roads were built, but construction on Phase 1 of the freeway didn't start until December 1985. 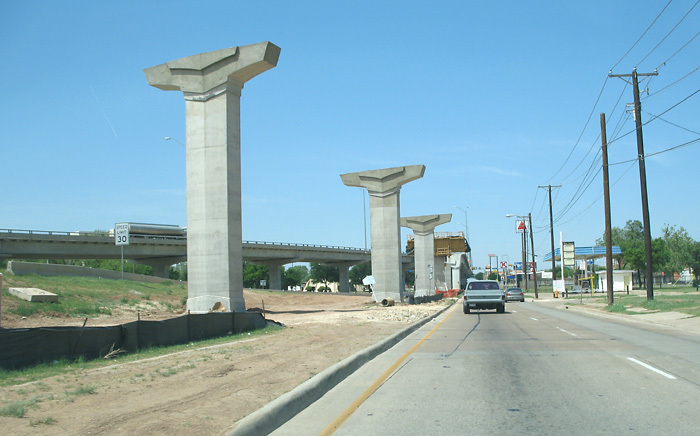 The first portion of Kell was constructed from Kemp to Harrison Street and was completed in December of 1988. Phase 2 from Harrison Street to Holliday Street was completed in July 1990. It took more than a decade for the dirt to start flying again on Kell Freeway for the section from Kemp Street to just west of Fairway Boulevard. 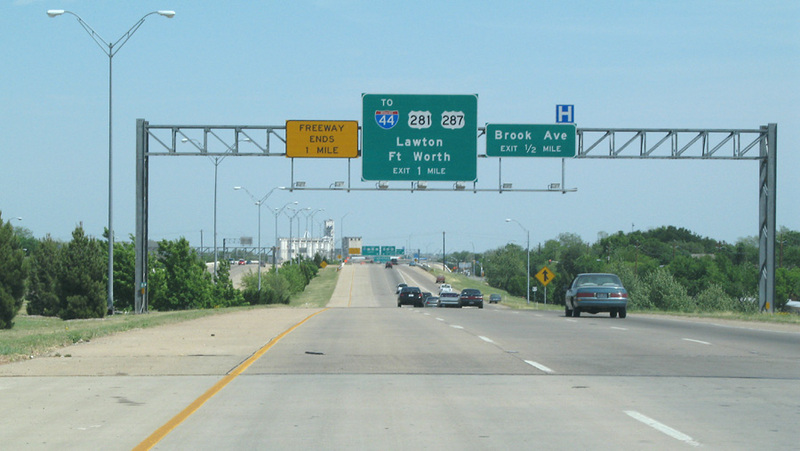 The contract was awarded in January 2001 and the freeway was opened for traffic March 13, 2003. The photos start going westbound near the freeway end. 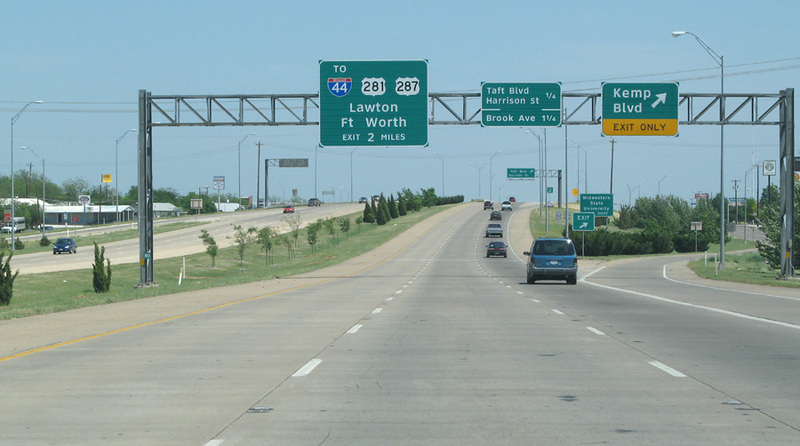 I then proceeded to the point where the frontage road configuration ends, turned around, and took most of the photos going eastbound toward Wichita Falls. Approaching the freeway end going westbound. We can see the end of the main lanes ahead. Here traffic exits to the feeder. The main lanes will be extended in the future. 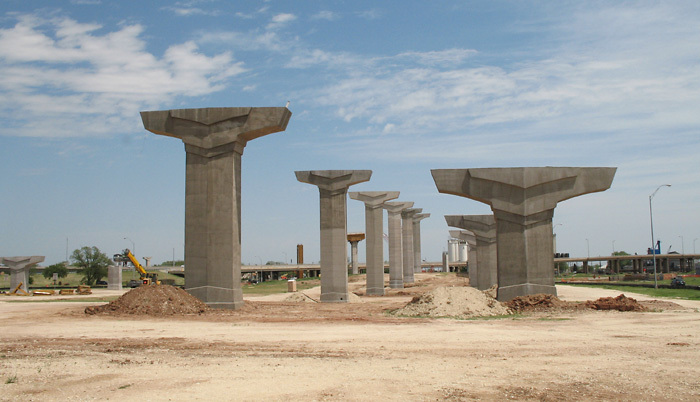 The TxDOT UTP does not list a construction date, which means the project is not yet funded and will likely occur after 2010. 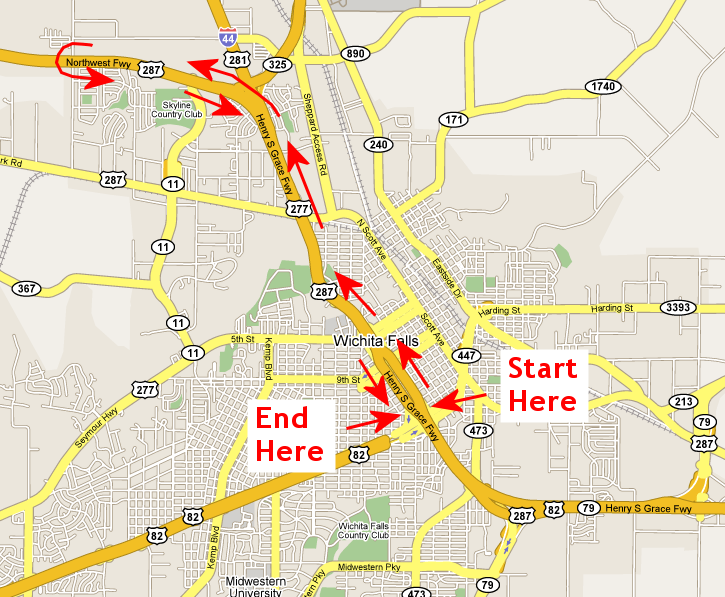 I proceeded west until I reached the point where the frontage road configuration ended. Then I turned around and took this photo. 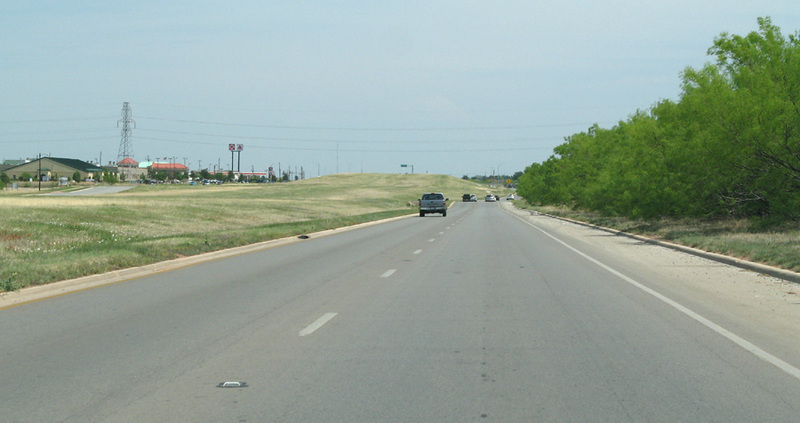 This view looks east along the grassy median with the frontage roads on the left and right sides. 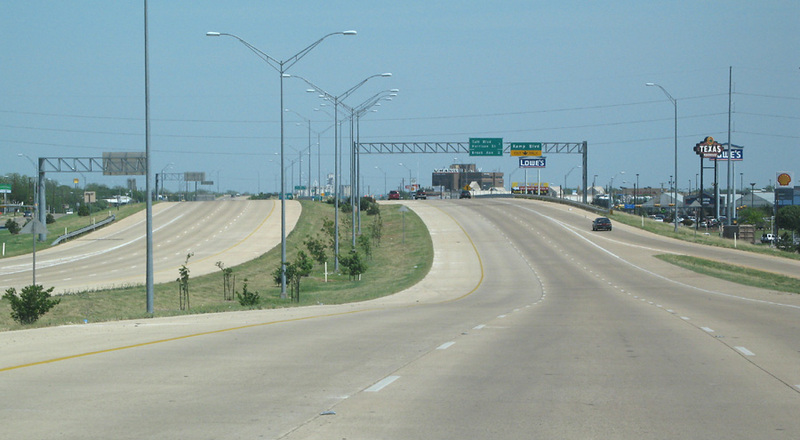 The freeway corridor width is roomy for its entire length. It looks like it is around 400 feet wide. 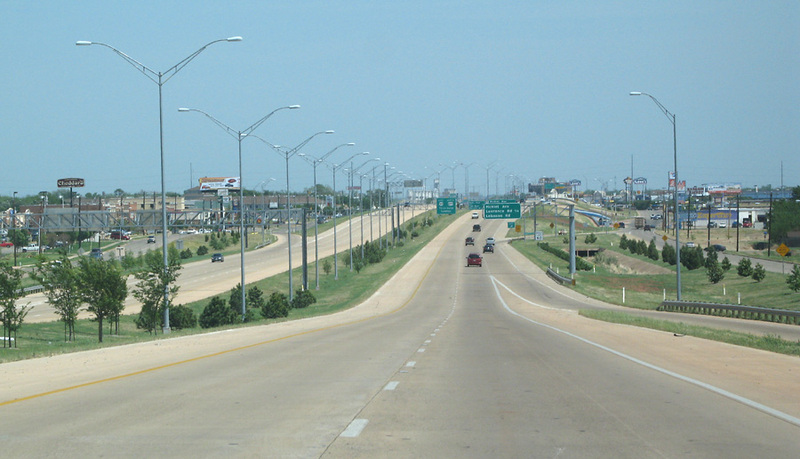 This is the frontage road intersection with FM 369. 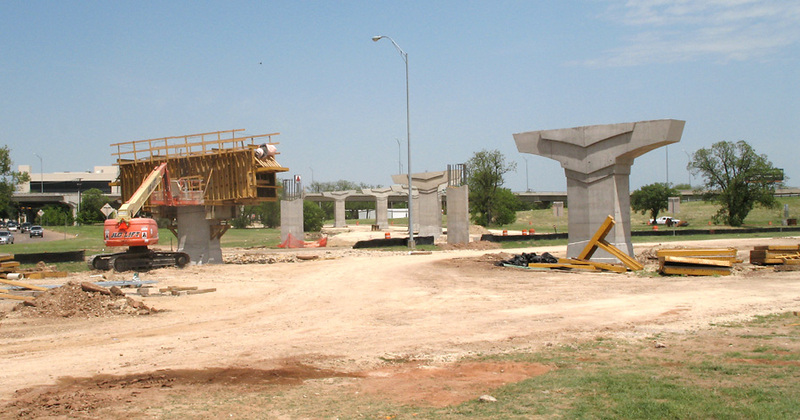 Embankment is in place for the future freeway overpasses. 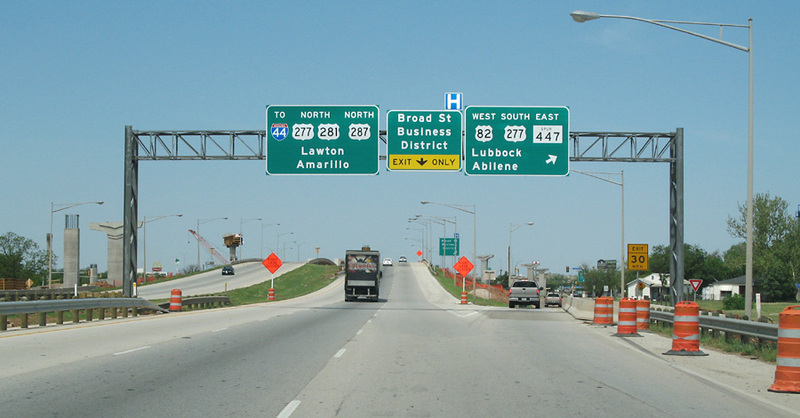 This is the frontage road intersection with business US 277. Approaching Barnett Street we can see the wide grassy median for the future main lanes. 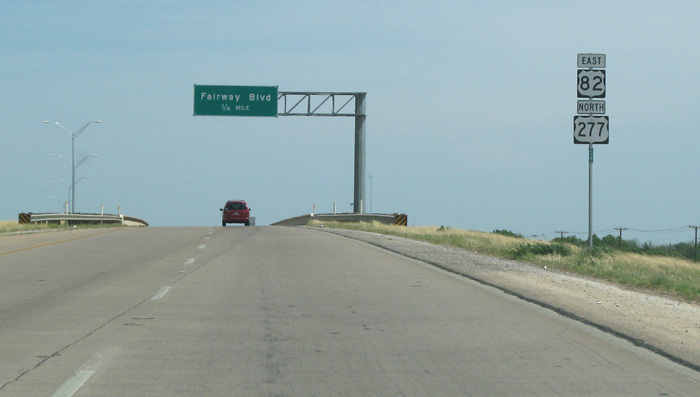 The freeway starts just east of Barnett. 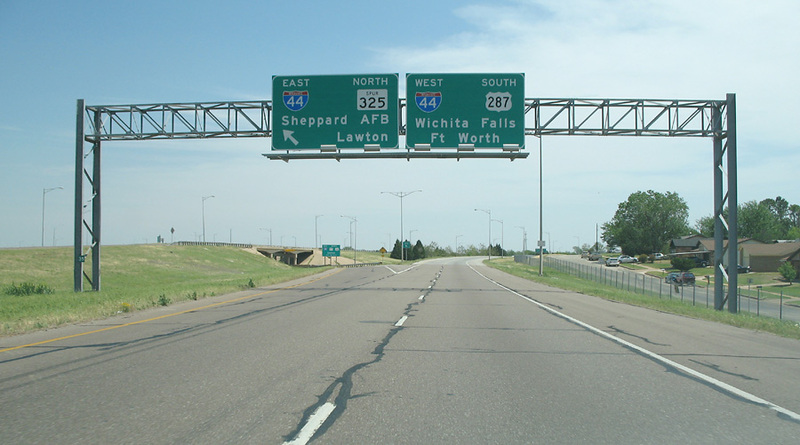 A view of the highway shields. At the Fairway Blvd exit. At the McNiel exit. The freeway now has 3 lanes each way. The Brook Avenue exit features braided ramps. 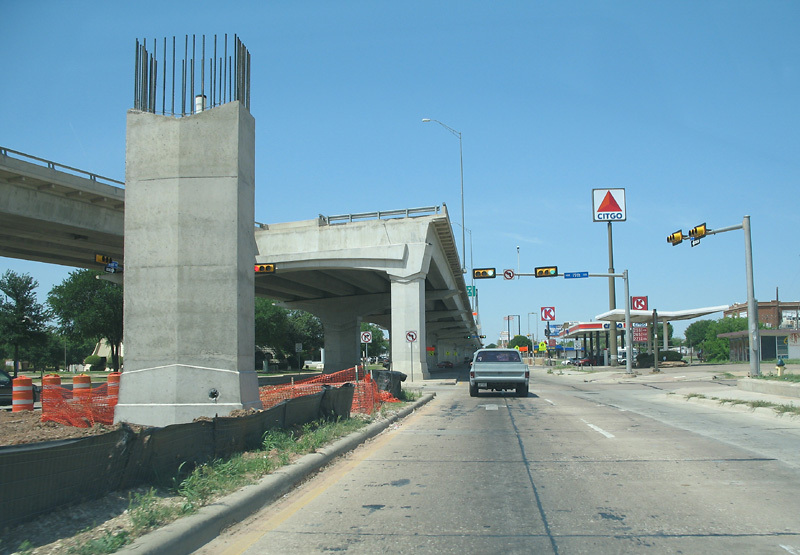 Here we reach the end of the freeway and the construction zone for the ramps to 287/281. At the end of the freeway. Along the feeder road the piers for the new ramps are visible on the left. 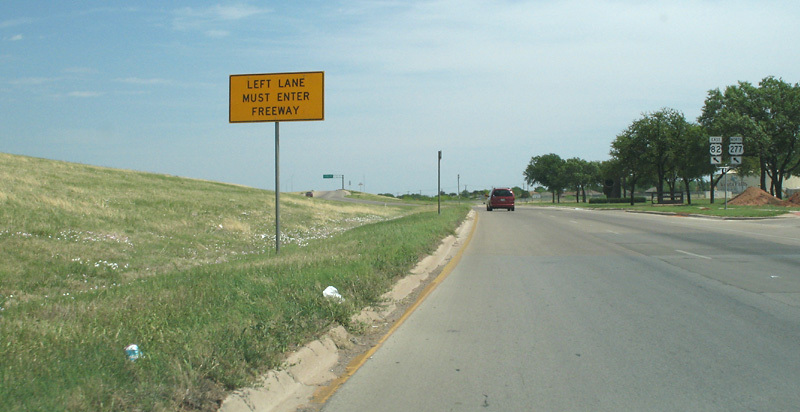 This is the view as we turn left onto the frontage road for US 287/281. Proceeding on the frontage road we see some piers. 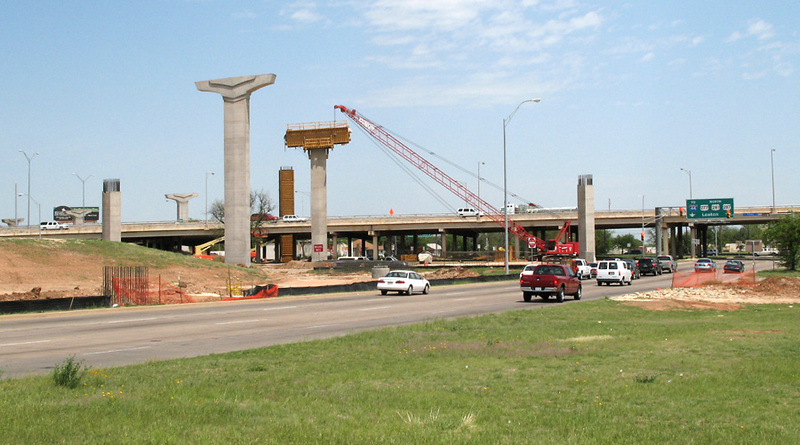 At the north end of the construction zone, we see where the ramp will connect with the exiting US 287/281 elevated freeway. 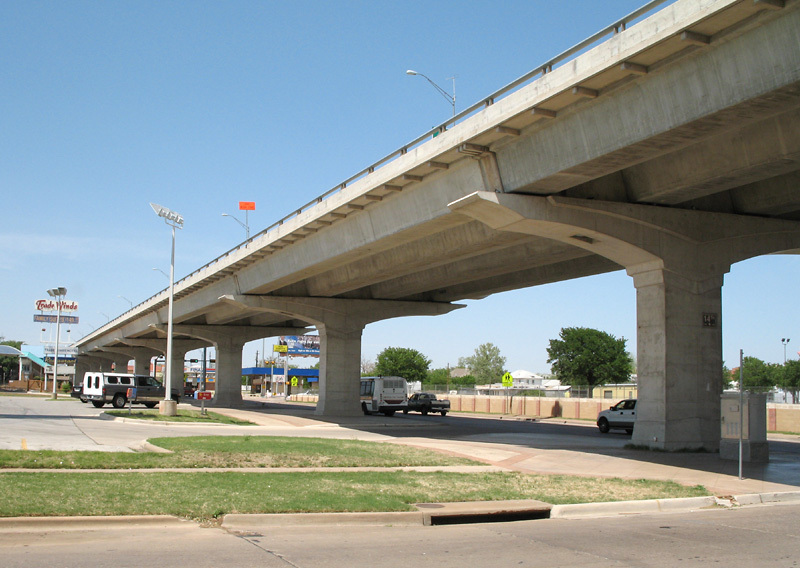 These views start with the elevated freeway through downtown Wichita Falls, which opened on November 13, 2001. 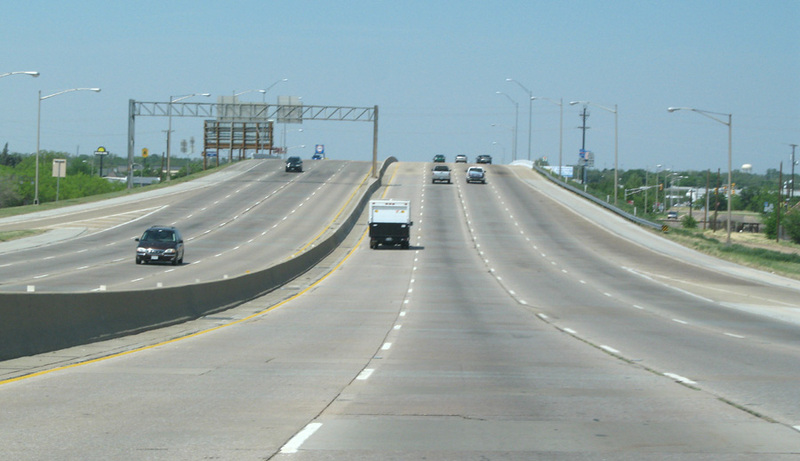 Interstate 44 begins just north of the elevated structure. We'll follow it until the US 287 split and return for a few more photos. Here we are exiting from the freeway so we can see the elevated structure at the ground level. Piers for the new ramp are visible on our right. More piers for the ramp. 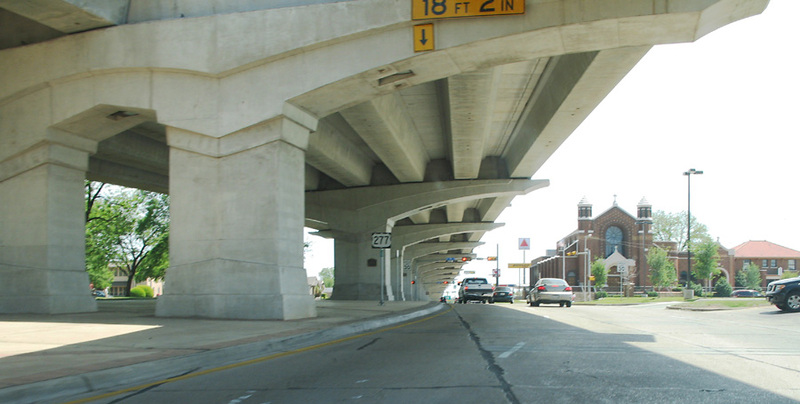 This is on the ground-level frontage road underneath the elevated structure at 14th Street. 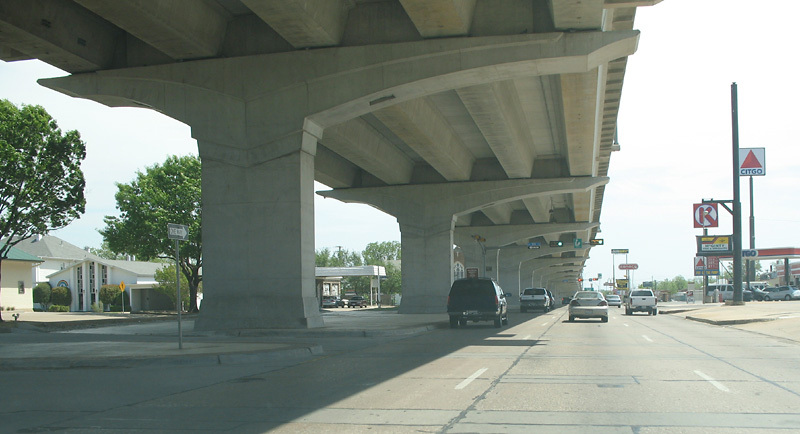 Here is a side view of the elevated freeway. Underneath the elevated structure at 10th Street. 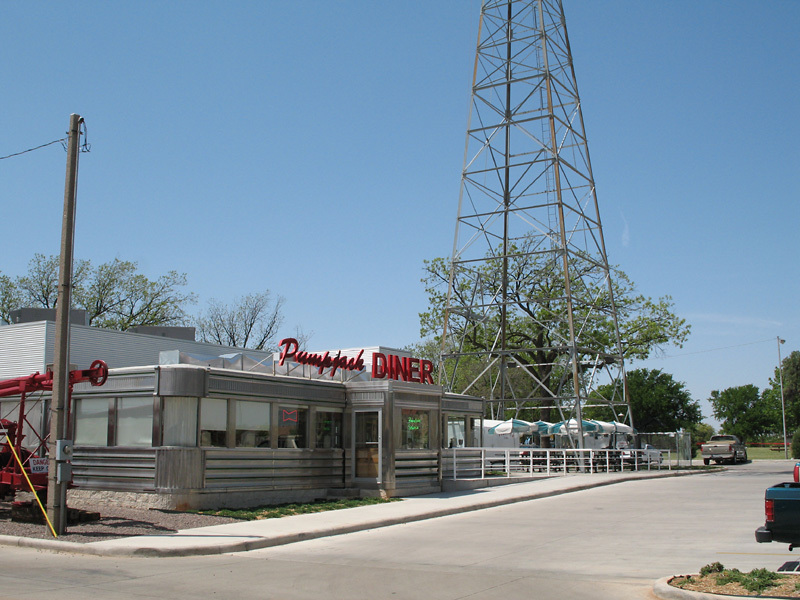 The Pumpjack Diner is just north of 10th Street. The Diner features an old-style oil derrick in the outdoor dining area. 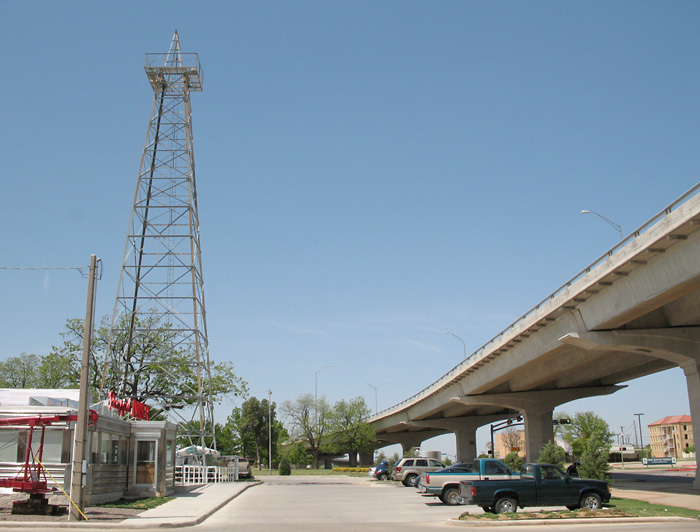 The elevated freeway is right in front of the diner. This is a closer view of the Pumpjack Diner. 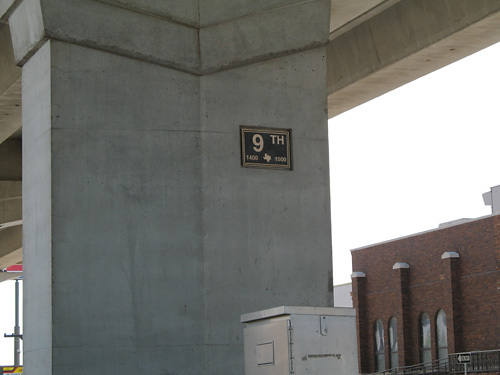 The vertical supports for the elevated structure feature plaques indicating the cross streets. Here we are approaching the end of the elevated structure. Just about to get on the freeway which is a multiplex for US 287/281/277 and I-44. 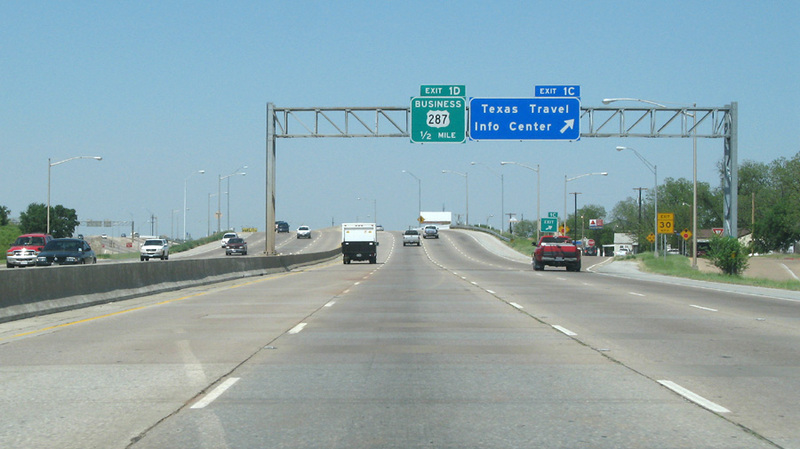 At the split for US 287. We'll follow US 287. 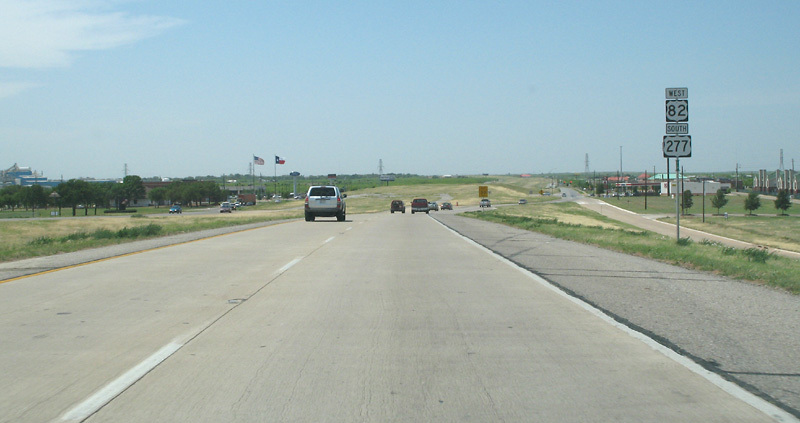 On US 287. 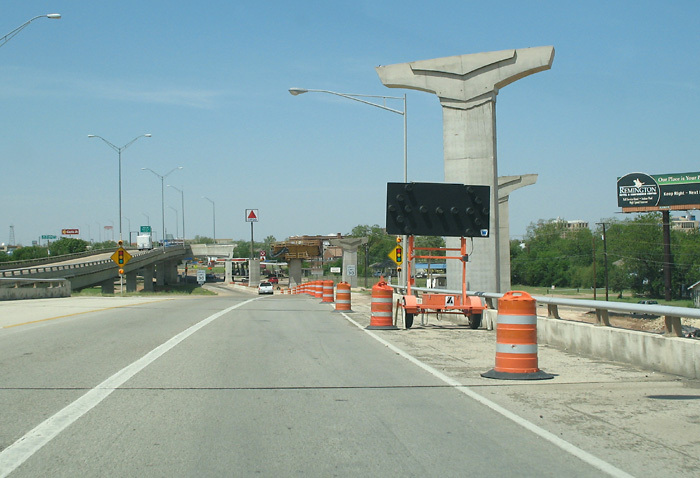 Notice the old-style cast-in-place concrete overpass. 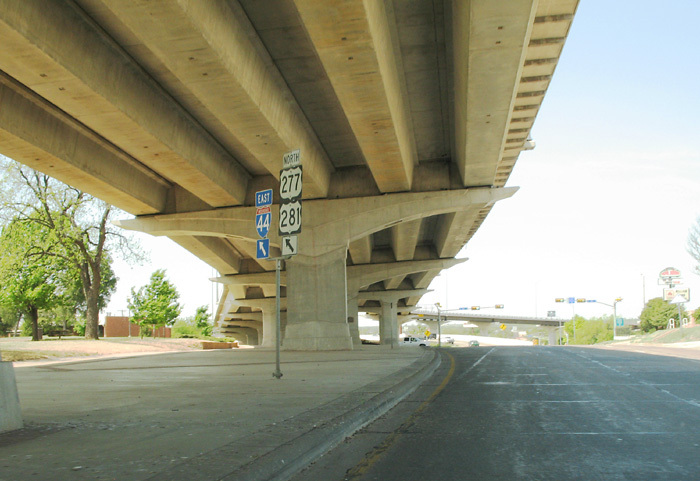 This type of design goes back to the 1960s, so this is one of the older freeways in Wichita Falls. I exited and turned around to go back toward Wichita Falls. 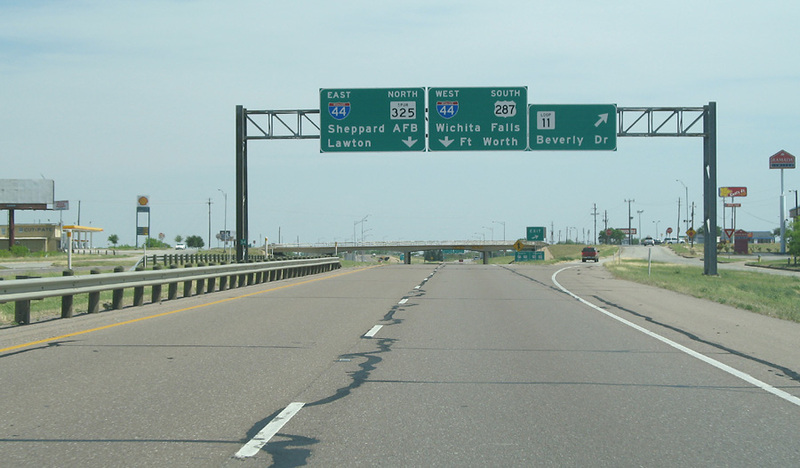 This view is southbound on US 287 at Beverly. 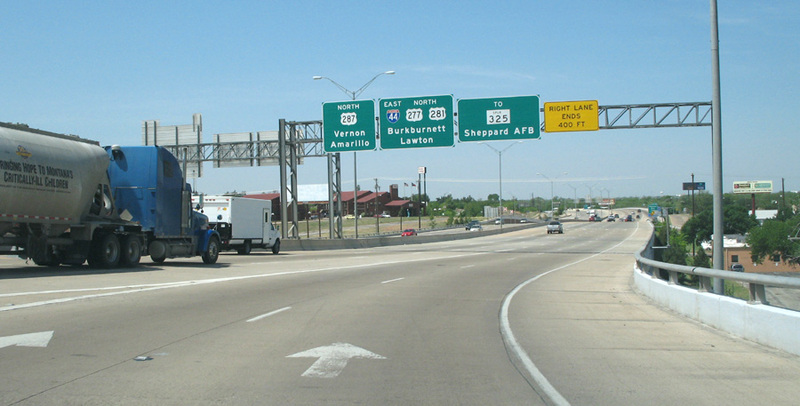 Southbound on US 287 at I-44. 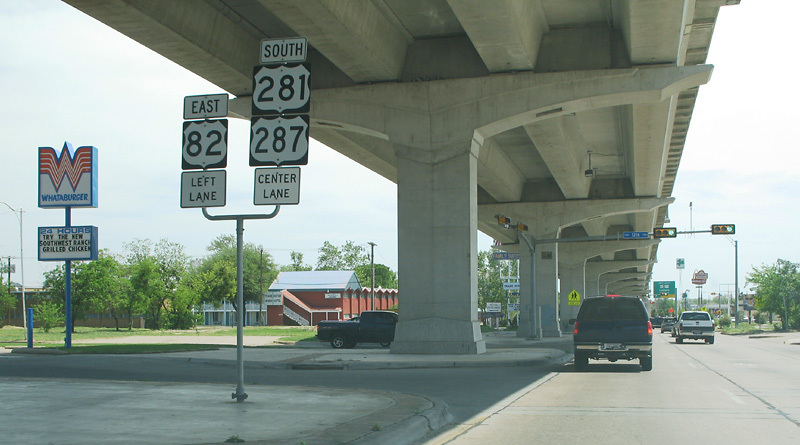 This is the downtown exit going southbound on US 287/281. I-44 appears to end at this point. 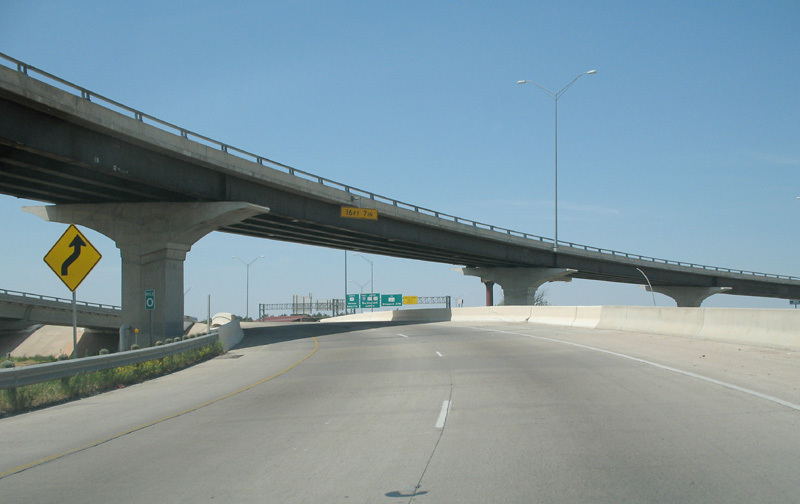 The main lanes are on the elevated structure. I exited to the frontage road. Proceeding on the frontage road underneath the main lanes. 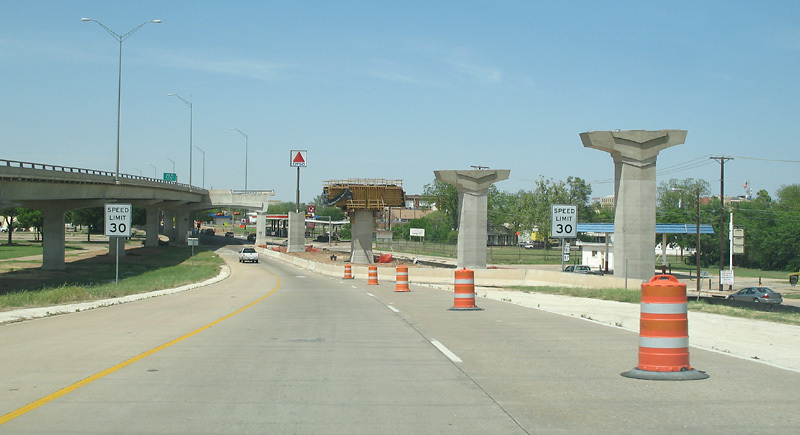 Notice that the northbound elevated main lanes are not visible. They are a block to the east. Looking north along the southbound elevated structure.